HOT DEAL! 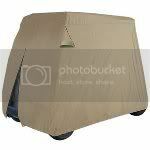 The Fairway Golf Car Cover protects any two-person golf car from sun, weather damage or dirt. Features a handy rear zipper for easy entry and installation, rear air vents to reduce wind lofting and inside moisture and an elasticized cord in the bottom hem for a custom-like fit.